Click the map to enlarge it. See the key to points of historic interest, below. 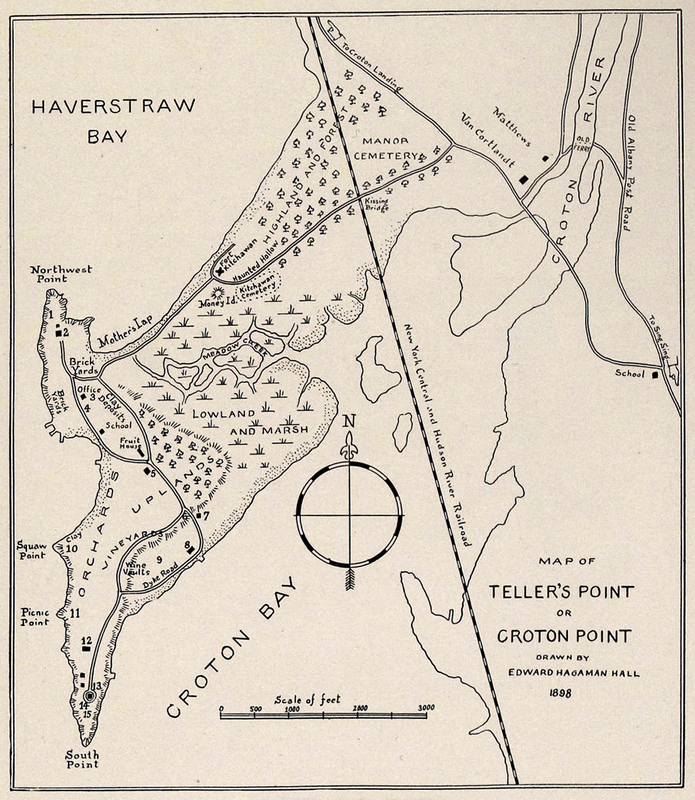 This fascinating map of "Teller&apos;s Point or Croton Point" was drawn by Edward Hagaman Hall for an article published in the March, 1898 issue of the magazine The Spirit of &apos;76. In addition to recording the roads and buildings, Hall provided a numbered key (see below) to points of historic interest. Edward Hagaman Hall was a journalist who became involved in a variety of preservation organizations at the turn of the century. According to the New York Preservation Archive Project, Hall&apos;s "efforts in preservation can be attributed in large part to the City Beautiful movement in the early 1900s. . . . Hall was pivotal in the nascent efforts to pass legislation monitoring the aesthetic fabric in New York City." He was also an officer of the Association for the Protection of the Adirondacks and the American Scenic and Historic Preservation Society. Place whence Peterson and Sherwood fired on the boat . . . the Vulture, September 20th, 1780. Descendants of Peterson have the musket. Cannon ball found by Eugene Anderson, who now has it. It weighs five pounds. Old musket ram-rod found in clay. In possession of H. G Morehouse. Old oak tree, a landmark. No one knows how old. Cannon ball weighing nearly six pounds, plowed up in meadow. Squaw Point. Directly opposite, on the western bank, André landed from the Vulture and first met Arnold. Picnic Point, where Enoch Crosby, Cooper&apos;s Spy, once enticed ashore and helped capture a boat-load of British soldiers. Farm house 135 years old. Italian villa built by Dr. Robert T. Underhill, deceased. Cannon ball found lodged in a tree about eighty years ago, by Dr. Underhill. The ball is now in possession of S. W. Underhill and weighs about six pounds. The tree is not now standing, and the oldest inhabitant does not remember in which side of the tree the ball lodged. Place where earthworks were thrown up by Americans2 when they brought the cannon down to the point. Vouched for by S. W. Underhill, who lived there for sixty years. Dotted shore is low and sandy. Where the shore has declivity marks it is high and rocky. What happened to the “Manor Cemetery”? All the graves were moved. I will post information about the Manor Cemetery at some point in the future.